This game was made for the Ludum Dare 33 ! You are the leader of a monster pack and you send your minions to kill humans. However, the more you kill heroes, the better they are ! Fortunately, your powers increase too. Will you be strong enough to defeat the best hero ? 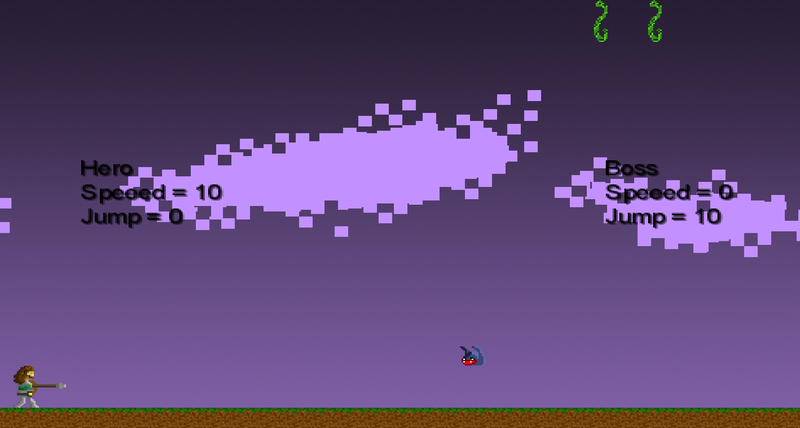 For this game (which is my first one), I chose to use libgdx with scala. I had to adapt some things but it worked perfectly well. I just had problems with errors messages which was sometime wrong : they did not show the real mistakes. I began by the physics of the game. Basically, you control an army of monster that you can use against a hero. This hero has a spear. When a monster touch the spear, it dies. If he touch the hero, the hero dies. When you do not have any monster left, you become the boss. When you killed a hero, both the stats of the next heroes and your stats increased. So, the last fight depends on what your army did before. 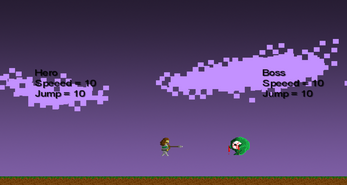 The game is a simple platform game. The background and the ground are scrolling. The characters can lay down, jump and move. Next, I integrated it to my game. I added screens, I animated my squares and made the background and the ground scroll. I did a basic "AI" based on if else for the hero when he fights against the boss. I did not wanted to do something hard. I did four levels that can be solved by different ways. They are quite short. For the control, the space key is used to jump, the directional keys to move, m to mute and 1, 2, 3 and 4 and launch monster. You can also click on the monster to launch. I had problems when resizing my window : all clickable area became impossible to click. To play to the game, use the .jar desktop.jar . You can find the sources compressed. I put what I added to the libgdx basis.